The flight will depart Ardmore Airfield to the south towards Bombay and Kaiaua returning along the Firth of Thames coastline to Maraitai on the outskirts of Auckland City back to Ardmore. Enjoy the stunning rural scenery of the south Auckland hinterland, the Hunua ranges, Firth of Thames and inner Hauraki Gulf Islands. All this time soak up the experience of your World War II aircraft. Flight duration: approximately 25 minutes airborne. The flight will depart Ardmore Airfield via the Wairau River then coastal to Maraitai, Waiheke Island, Rangitoto Island, Takapuna on the North Shore, Waitemata harbour in the heart of Auckland City then return to Ardmore via Musick point, and Whitford. 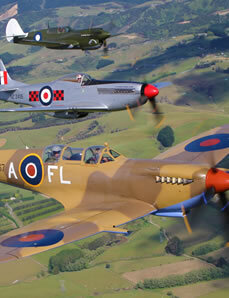 You will enjoy the vista of the inner Gulf island, downtown Auckland City and the experience of flying in a classic World War Two aircraft. Flight duration approximately 25 minutes airborne. For the more adventurous, this flight will depart Ardmore Airport south to Miranda on the Firth of Thames for aerobatic manoeuvres. Return to Ardmore via the Hunua Ranges and coastal low flying area. The aerobatics are not extreme, rather classical manoeuvres of chandelles, rolls and loops. Experience the true feel of these fighting machines and flight at five hundred feet, the only thing missing is the bad guys shooting at you. Duration approximately 25 minutes airborne. If these standard flights do not appeal we can tailor a flight to your requirements. We believe you are the customer and this flight is for your enjoyment, you tell us what you want and if we can do it we will. Prices are effective May 2017. Prices are NZD and include all taxes and levies. Maximum weight 100kg, Maximum height 6 ft 2.